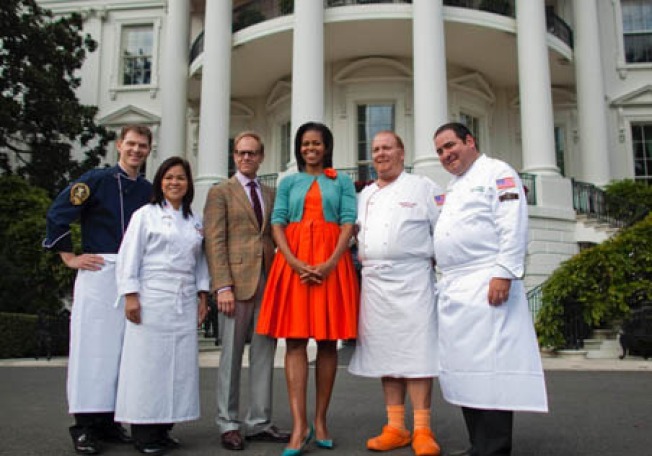 A publicity shot of the recent "Iron Chef America" episode at the White House. Jan. 3 was suppose to be the crowning moment for the queen of slow food. But instead it turned out to be a giant farce. The Food Network trumpeted its episode of White House edition of "Iron Chef America" for months as the show's biggest episode ever. And the numbers matched the hype. More than 7.6 million people watched chefs Mario Batali and Emeril Lagasse battle Bobby Flay and White House chef Cristeta Comerford, using a secret ingredient allegedly from the White House garden. The very same garden that the chef of Chez Panisse petitioned First Lady Michele Obama to harvest to "demonstrate to the nation and to the world our priority of stewardship of the land." But the brilliance of the show fell victim to one of the vital components necessary for the slow food movement: time. The Food Network admitted it used "replacement produce" instead of actual fruits and vegetables from the White House garden. A production delay was blamed for the cover up. Network officials did however assert that only replica fruits and vegetables that could be found in the garden were actually used.